The Astro Saber portable radios were introduced in 1992 and operated on P25 Phase-1 digital trunking systems. Not only did they serve as a communications device, but they could be used as both a weapon (if thrown correctly) and tool (hammer/paperweight) - even though they were clearly not intended for this. I still see some in use today! I first had my hands on one in 1995 (pre-standard with VSELP). 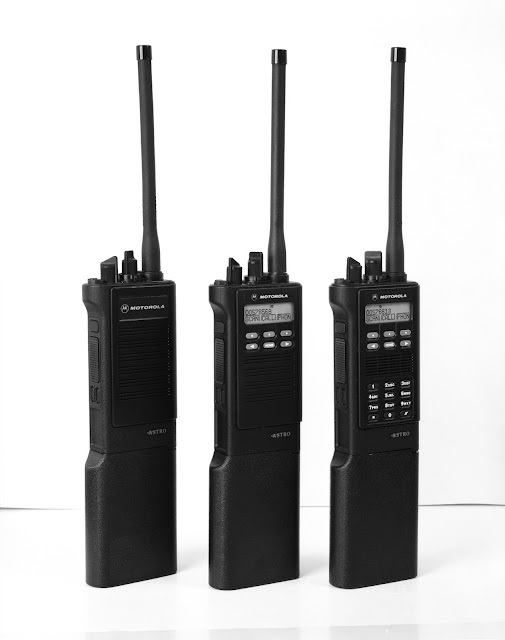 Great radios and I still use one for P25. The form factor just can't be beat. If I'm not mistaken only the 800 MHz model supported P25 9600 bps digital trunking. When I first started I used to repair them. I know of at least one customer who still has a number of them, probably still in daily use.